Our records show that you havenât come forward to claim the âGrazia Milleâ prize of One Million United States Dollars. The deadline date is fast approaching and if we do not receive your claim immediately we will move to cancel your prize without further notice. Christmas is just around the corner and just like everybody else we at Lotto Natale love to get in to the Christmas spirit, and this year we have all the more reason to celebrate for it is our 10th anniversary this December, and to celebrate we are launching our first international program, The âGrazia Milleâ promotion With this program we intend to make this Christmas exceptionally special for ten winners and all the more memorable by giving you a chance to get One Million United States Dollars! Yes, $1, 000, 000, 00. With the introduction of new types of games and the ushering in of on-line technology and with the permits issued under EU law to EU countries to compete for concessions to run games in Italy and on the internet, we are launching our first online international program called: âGrazia Milleâ What better time to join the internet gaming than with our 10th anniversary. 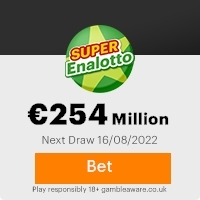 In this program in place of tickets or numbers in the ballots we use e-mail addresses and from the draw of the âGrazia Milleâ program that took place on the 4th of November 2006, your e-mail address coupled with claim code 925/MSB/011-04/06 came up as the winner of One Million United States Dollars in this promotion. All winnings must be claimed not later than the 15th of December 2006. After receiving the prize, you are required to come to Milan, Italy on our all expense paid trip to appear on our TV program about this promotion. This program will be recorded at the Rai Uno studios on the 20th December to air 25th December 2006. All entries must adhere to the âGrazia Milleâ Terms and conditions stated in our official page. This program is strictly for international participants and all Italian residents are exempt from participation. To view the terms click on this link: http.termsofclaim.gq.nu/index.html, or paste it in your browser. Not providing the above mentioned requirement when replying can lead to disqualification. Previous: Attention!! !Fresh ScamsNext: JULY 2006 BONUS. This Email with the Subject "Attention!!!" was received in one of Scamdex's honeypot email accounts on Tue, 21 Nov 2006 06:42:42 -0800 and has been classified as a Generic Scam Email. The sender shows as nancy@nancy0.orangehome.co.uk, although that address was probably spoofed. We recommend that you do not attempt to contact any persons or organizations referenced in this email, as you may expose yourself to scammers and, at the very least, you will be added to their email address lists for spam purposes.